We directly integrate with several different tools, currently focused around email marketing tools. We'll be continuously expanding these integrations, as well as adding other types of tools! Once in Settings, you'll need to navigate to the Integrations tab. 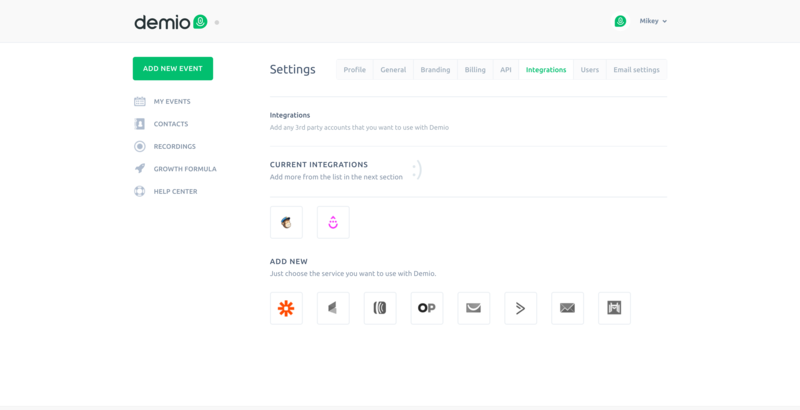 From there, you'll be able to manage the integrate options that you've connected as well as connect new ones. Feel free to use one of our step-by-step guides for a specific integration too. Now that your integration has been connected with Demio, you'll be able to enable and set specific settings from the Integrations option card within the event.